Every once in a while a sandwich sounds really great, and while there are Paleo breads out there that we could make to enjoy a sandwich, I don’t really miss the bread too much. It’s more the flavors I miss, like a good BLT sandwich. Good news though…we’ve got all the flavors of a BLT wrapped up in this BLT chicken salad that we love to eat in little lettuce shells rather than between two slices of bread. 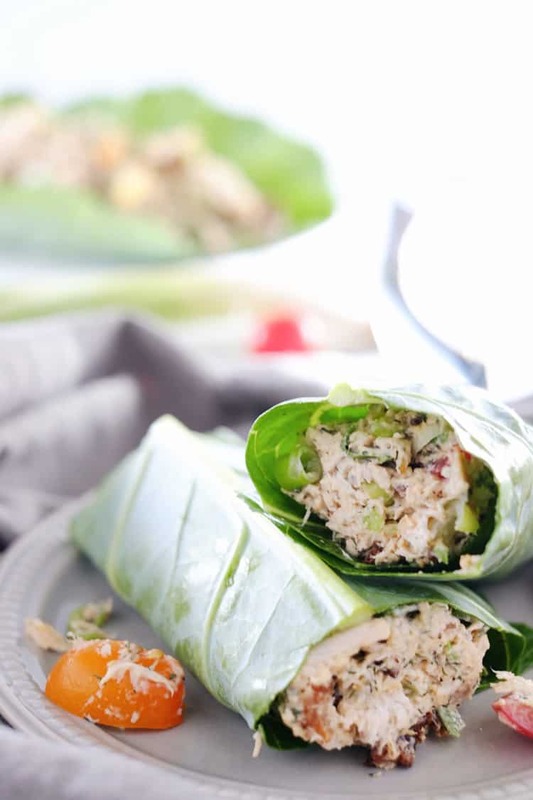 We love how quick and easy this chicken salad comes together! You can use leftover chicken to make this as quick and easy as possible, or make a batch of shredded chicken in your crockpot. Just add your chicken and some bone broth or salsa and cook it on high for three hours or on low for six hours. 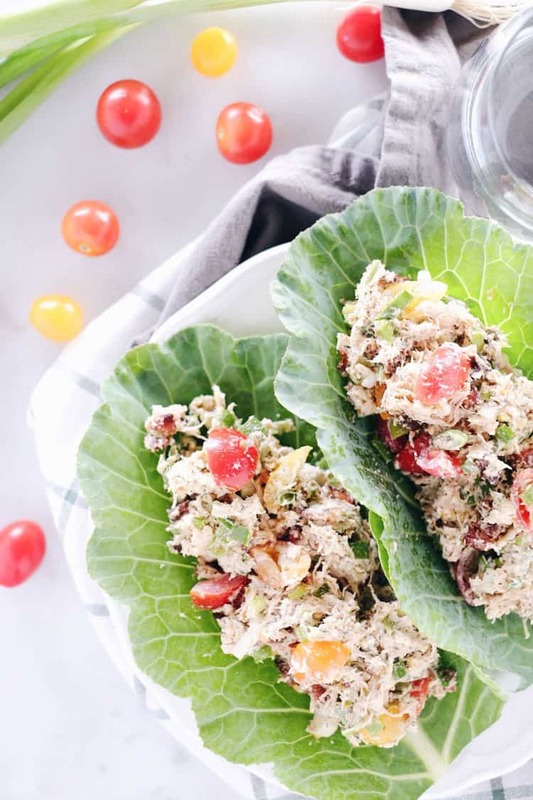 We love having leftover chicken just so we can make this BLT chicken salad! Not including cooking the chicken it takes about 10 minutes. Such a breeze! 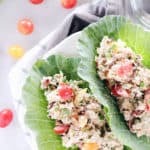 This BLT chicken salad can be eaten a variety of ways, like the recipe calls for on lettuce shells or as a dip for plantain chips and veggies. It is great for packing for lunch during the work week, as a quick and easy dinner, or as an appetizer at a gathering. You can bet we will be bringing this dip with us to tailgating season, starting this coming weekend! It’s a real crowd pleaser, and nobody even realizes it is full of healthy fats since we use Primal Kitchen Mayo, made with avocado oil and only clean ingredients. Go ahead and make this BLT chicken salad with your leftover chicken! It is delicious and filled with protein and good fats! Let us know how it goes by leaving a comment below. Also, take a photo and tag us on Instagram @realsimplegood, so we can check it out! 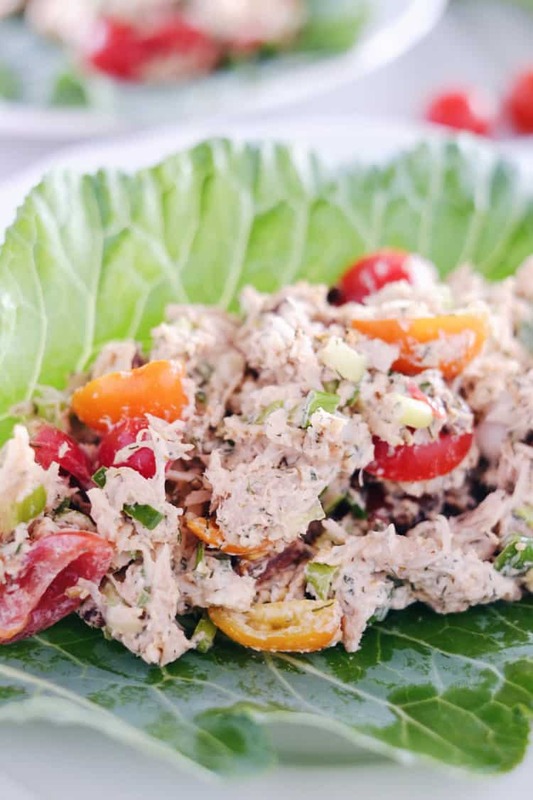 We've got all the flavors of a BLT wrapped up in this Paleo + Whole30 BLT chicken salad! We love to eat it in lettuce shells or as an easy snack + dip. « Pre-Order Our 30 Minute Paleo Meals eCookbook + an exciting bonus!